Jr. Librarian, Library Assistant Jobs under Labour and Employment Department, Law, Justice & Parliamentary Affairs Department and Health & Medical Education Department. There are total 333 vacancies available in JKSSB Recruitment. 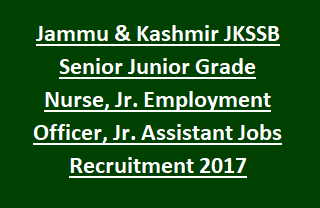 Candidates with eligibility criteria have to submit application forms for JKSSB Sr/ Jr Grade Nurse vacancies from 06/12/2017 to 30/12/2017. Application forms for the above JKSSB posts available at www.ssbjk.in. Jammu and Kashmir SSB Application forms will be accepted only through online. For more information of Jammu and Kashmir Services Selection Board JKSSB Recruitment of 333 Sr/ Jr Grade Nurse, Jr. Employment Officer, Jr. Assistant Govt Vacancies notification dates, available vacancy, Age limit, pay scale are mentioned below. Total vacancies available in Jammu and Kashmir Service Selection Board JKSSB Recruitment are given below. Total no of vacancies: 333 posts. Name of the Department: Labour and Employment Dept, Health & Medical Education Dept and Law, Justice & Parliamentary Affairs Department. 1. Management Executive/ Counsellor: 05 posts. 2. Junior Employment Officer: 19 posts. 3. Jr. Stenographer: 04 posts. 4. Jr. Assistant: 14 posts. 5. Sr. Grade Nurse: 89 posts. 6. Jr. Grade Nurse: 200 posts. 7. Jr. Librarian: 01 post. 8. Library Assistant: 01 post. Please check the JKSSB Notification for Qualification details. Selected candidates for JKSSB recruitment vacancies will be offered pay scale as per J & K Govt instructions. See the Notification of JKSSB for Age limit and relaxation details. JKSSB selection board will be held written examination/ interview to select candidates for J & K SSB vacancies. Please go through Jammu and Kashmir SSB Notification for other selection process details. Eligible candidates have to read the JKSSB notification for eligibility criteria. Candidates may get the Application for J & K SSB application form the web portal www.ssbjk.in. Online application submission starts from 06/12/2017. Last date to send Jammu and Kashmir SSB application forms through online only is 30-12-2017.